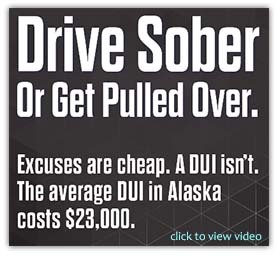 "To enhance the health and well being of Alaska's people through programs aimed at saving lives and preventing injuries on Alaska's highways." Miles and miles of the Dalton Highway. The Alaska Highway Safety Office (AHSO) coordinates highway safety programming focused on public outreach and education, enforcement, promotion of new safety technology, integration of public health strategies, collaboration with safety and private sector organizations and cooperation with state and local governments. AHSO administers federal funding to appropriate projects through a grant awarding process. The AHSO staff works with our partners in communities to develop strong projects with the message of Highway Safety for all Alaskans. We are also responsible for providing technical assistance to grantees and ensuring compliance with federal program regulations and guidelines. The AHSO is also responsible for counting and analyzing the State's motor vehicle crash fatalities through the Federal Fatality Analysis Reporting System (FARS) program. In 2016 Alaska had 84 traffic-related fatalities in 78 fatal crashes. Preliminary reports show that in 2017 there were 79 fatalities in 75 fatal crashes. Alaska’s Observed Seat Belt use rate has increased 9.3% from 82.4% in 2007 to 90.1% in 2017.